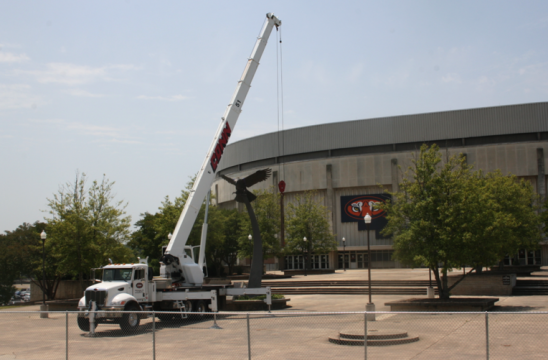 The eagle in front of Beard-Eaves Memorial Coliseum is about to become a temporary casualty to construction. Work on Auburn’s new Student Activities Center is displacing the eagle to parts currently unknown. Where will the bird be reside until a new home is found? The removal will begin tomorrow. Where exactly is the new SAC going to be? I’ll let them store it on my front lawn for free if they will deliver! On a similar topic, I always wondered what happened to the jumping tigers that were once in J-H on the scoreboards. Did they ever decide where the eagle was going?